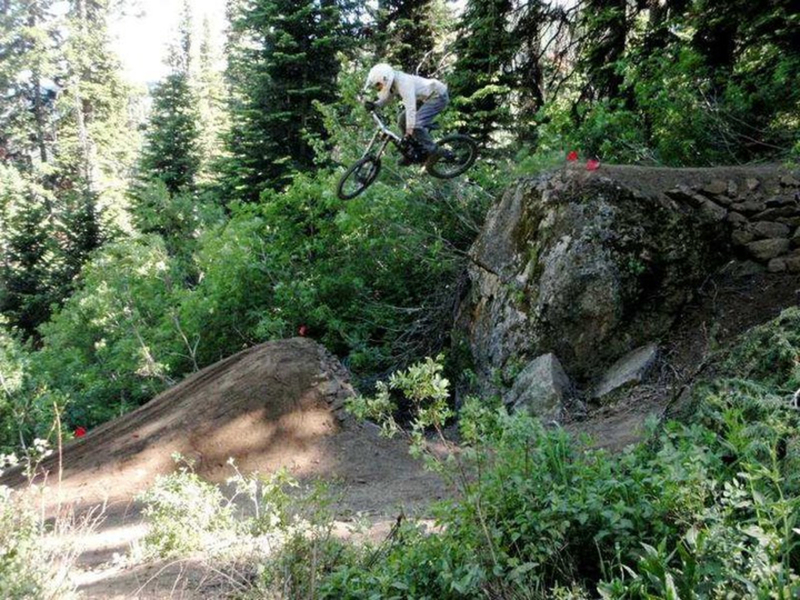 Hit many of Teton Freedom Riders' Teton Pass freeride trails in one hour. Pass Crater Lake and start counting the switchbacks. We count the one the lake sits at the bottom of as #1; it heads southwest. The next one, #2, curves to the right. At the end of #2, the roads curves left, but you want to stay straight. There’s a singletrack trail there called the Phillips Connector. It goes to the Phillips parking lot, about 2/3s of the way up Teton Pass. You could cross Highway 22 here and ride up Phillips Ridge,but that’s a different experience. Instead, at this parking lot, look for the trail marked Jimmy’s Mom. (And no, we don’t know who Jimmy’s Mom is.) That’s where you’re going. And you get to go big right from the start: Jimmy’s Mom starts with a huge feature—a giant rock you can ride off the back of and get serious air. And then there’s another air up onto a different large boulder with air off its back too. Every freeride feature has a ride around though. Descending the trail, there are lots of small to medium gaps and twists and turns. It’s fast, fun riding. You’ll hit an intersection where you could head back to the Phillips Connector trail and then Old Pass Road. Stay left there though for Lower Jimmy’s Mom. This section has bigger features than upper Jimmy’s Mom, but there are still ride arounds. This trail deposits you almost at Crater Lake. Ride back up Old Pass Road to the end of switchback #1. Look left at the end of that switchback (as the road curves right) and you’ll see the Powerline Jumps trail. Powerline Jumps is only five minutes, but it’s a fabulous five minutes. You’ll emerge onto the Old Pass Road just above Crater Lake again. Ride down the road until just past the lake, where the Parallel Trail heads up a hillside on your left. This has the biggest and most adventurous features of any of the freeride trails described here. And even the ride arounds here aren’t so easy: think a three-foot drop off a root. Parallel takes you right to back to the parking lot. A fast, fun ride with lots of features, gaps, twists and turns. The starting point is the parking lot at the end of the Old Pass Road. From here, ride up the Old Pass Road—it’s closed to cars at the parking lot, but pedestrians and cyclists can ride Old Pass Road all the way up to the top of Teton Pass—to Crater Lake.